The summit of Freel Peak (right) and Job's Sister (left) from an opposing ridgeline. The cobalt blue waters of Lake Tahoe from the summit of Freel Peak. This 15.0 mile roundtrip hike is 7.5 miles to the summit from the Fountain Place Trailhead. This hike has a long approach and over 3,000 feet of elevation gain through sun-exposed terrain and few water sources. This is based on 15.0 miles round trip with 3,200 feet of elevation gain assuming a pace of 2 miles per hour and adding 30 minutes for every 1,000 feet of gain. The high elevation of this hike means that you typically must wait a bit longer for the summit to be accessible. This is an incredibly long hike with very few water sources. Canine friends are not recommended. Holding the honor of the highest summit in the Lake Tahoe region at 10,881 feet, Freel Peak looms like a giant sand dune above South Lake Tahoe. Freel is a long, challenging hike that rewards summit attempts with outstanding panoramic views of Tahoe, the Carson Valley, and miles of sprawling peaks to the south. Intermediate and advanced hikers will be tested by this high altitude hike, especially once climbing above the 10,000 foot mark. Despite the challenge, this is one peak that should be on every hiker’s bucket list. From the Fountain Place Trailhead, follow the weaving Armstrong Pass Connector trail for 3.6 miles and 900 feet of elevation gain through densely wooded forest to Armstrong Pass. This can also a popular mountain bike trail, so be aware the bikers may be descending the trail at any time. 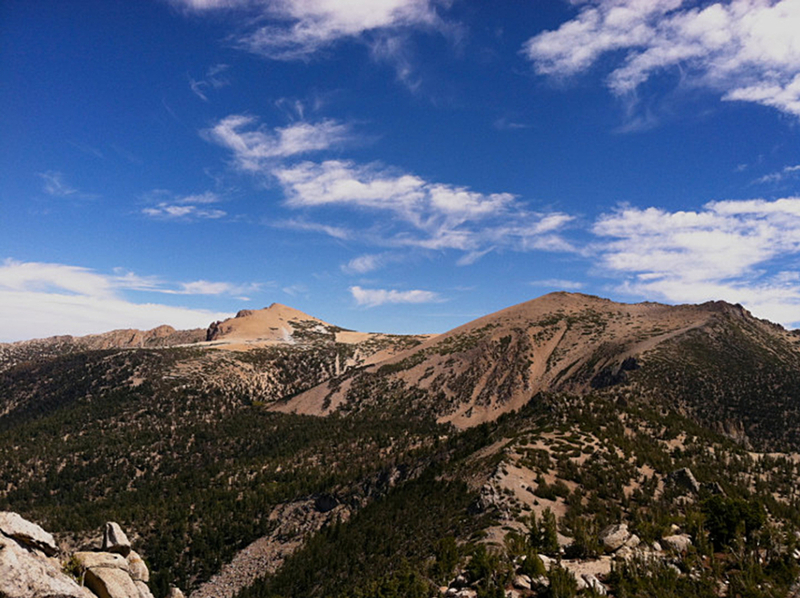 At Armstrong Pass, take a right on the Tahoe Rim Trail as it begins to climb the south facing shoulder of Freel Peak. The trail crosses several seasonal streams, waterfalls, and blooming wildflower sections as it ascends 2.9 miles up a series of wide switchbacks to Freel Pass at 9,600 feet. Stunted Western White Pine offers shade as you take in the view of the hillside dropping away to the immense valley floor below. After a total of 6.5 miles of hiking at 2,000 feet of elevation gain, you will reach Freel Pass and the junction to the final summit trail. This is a great resting spot to take in views of Tahoe and High Meadow before making the final push for the peak. The last mile of trail gains an additional 1,200 feet of elevation in just 1.0 mile, while also crossing the 10,000 foot mark that tends to make the effects of elevation noticeable. After a long approach of 7.5 miles and 3,200 feet of gain, reward yourself with big views and a long break before descending back to the trailhead. Intermediate to advanced hikers looking for a challenge to tackle Tahoe’s highest peak. Freel Peak is a long, but reasonable approach that rewards hours of effort with breathtaking summit views. This is a long, sun-exposed trail with very little water. Hikers should be well prepared with plenty of water and essential hiking gear. The long mileage and elevation gain mean this hike is not recommended for beginner hikers or young children. This trail is also popular with mountain bikers, except for the last mile of trail to the summit of Freel. Respect between all trail users is always the best recommendation. To access the Fountain Place trailhead from South Lake Tahoe, drive West on Highway 50 toward Meyers. Just before Meyers, turn left on Pioneer Trail. Continue on Pioneer Trail for 0.9 miles then turn right on Oneidas Street. Oneidas continues past a Forest Service gate and becomes the single lane Fountain Place Road. Continue for 3.9 miles until the road dead-ends at a locked gate. Parking can be limited during busy summer months. There are no permits required but please respect the private property signs at the top of the road.